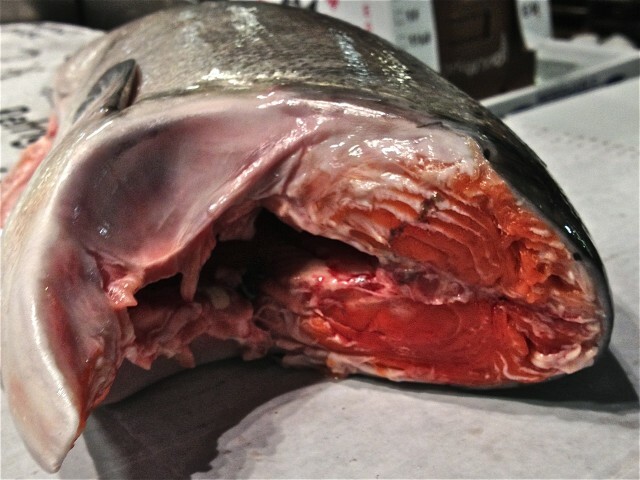 Whole wild-caught salmon at the New Fulton Fish Market [Image credit: Andrew P. Han]. It’s 1:30 AM at the New Fulton Fish Market in the Bronx, New York City. As forklifts zip pallets of seafood through ice-packed loading bays, the fishmongers of Lockwood & Winant are selling fresh Pacific King salmon right off the plane from Washington. Further down the large, cold, cavern, Montauk Seafood Co. has Coho salmon straight in from Alaska. These wild-caught fish glow a deep pink, fleshy ingots glistening on ice. Later today, they’ll be carved into sushi gemstones, gingerly set upon rice and seaweed settings at five-star restaurants in Manhattan. Farm-raised Atlantic salmon is also for sale here, like the fillets and steaks at your average grocery store. Based on price alone, the farm-raised fish is a steal — $3 per pound wholesale versus $10.50 per pound for wild caught. But a side-by-side comparison reveals a distinct difference in color: farmed salmon is light pink — almost orange — and has a flatter shine, without the rich hues of red. Color may not be the biggest difference. Nick Stockton — friend and fellow science writer, who once worked on an Alaskan salmon boat — says he tries to only eat wild salmon, mostly “to support the fisheries,” but also because it has superior taste and nutritional content. Yet color is such an important indication of quality that farmers will even dye the farm-raised fish red to increase its appeal. So why is wild salmon a deeper red than farmed salmon? Unlike beef, which acquires its distinct red hue from contact with oxygen in the air, salmon meat gains its color through the fish’s diet. Out in the ocean, salmon eat lots of small free-floating crustaceans, such as tiny shrimp. These crustaceans are filled with molecules called carotenoids, which show up as pigments all over the tree of life. In fact, if you’ve ever known a kid who turned orange from eating too many carrots, you’ve seen carotenoids in action. It’s these carotenoids that account for the reddish color of the salmon, as well as the pink color of flamingoes and the red of a boiled lobster. Farmed salmon, however, aren’t fed crustaceans. Instead, they eat dry pellets that look like dog food. According to the Atlantic Canada Fish Farmers Association, salmon chow includes ingredients such as “soybean meal, corn gluten meal, canola meal, wheat gluten and poultry by-products.” Carotenoids, which are also essential for regular growth, can also be added to help give the fish its distinctive color. Some king salmon – about one in 20 – have white meat due to an inability to process these pigments in their food […] In past years white king sold for about sixty cents less per pound than the more familiar red-fleshed king, and some fish buyers enjoyed this rarer king salmon for a bargain. Nowadays many believe white king’s flavor is more delectable than their more common cousin. The marketing tide has turned and now the fairer fish, marketed as “ivory king,” brings a higher price. So, in your salmon eating future, judge a fish not by its color, but by how well it goes with lemon, butter, and capers or soy sauce and wasabi. Nice attempt at a product attack, which you’re not even very good at. Terribly written piece. The point is: wild or farmed is good for you. To compare tastes, one has to discuss species, not whether farmed or wild. 6 different salmon Species taste different and all have a slightly different color based in their diet. Your fishermen buddy is at least honest-supporting the friends he has by buying their salmon. You however? Salmon – farmed or wild or wild-caught or ranched – all receive their colour from eating nutrients in their field. All good for us to eat – real good. The rest of your blah, blah, blah, is just trying to attack the (perceived) competition to bolster your love for “wild” salmon. It’s not too subtle bud. In fact, your confusing little story will only turn consumers away and to the hot dogs instead. Nicely done. The colour difference between farmed and wild salmon isn’t just because of what they eat. It is also because they are different species. Like sockeye and pink salmon have different colours because they are different species, Atlantic salmon (farmed) also have a different colour from sockeye and king salmon because they are different species. The flesh colour of a wild-caught Atlantic salmon would look the same as the flesh colour of a farmed Atlantic salmon. Your sentence about farmed salmon being “dyed,” citing a 10-year-old newspaper opinion column as a source, is untrue and should be removed from this article. Farmed salmon is not dyed, never has been and never will be. Like you point out, all fish get their colour from what they eat. Every Alaskan knows winter white kings are the best. The Stikene River run is 20% White Kings. Tasty doobie! Of course salmon farmers are going to lie about it…they count on the public NOT to do their homework! The deceptive pink/red/orange color found in farmed salmon is nothing more than a synthetic color chemical known as “Carophyll” that is designed to look like astaxanthin and other natural salmon colorings. Hoffman-La Roche and others actually have a salmon color chart known as “SalmoFan” that allows salmon farmers to pick the shade of pink they want added to their salmon food, much in the same way that one would pick a wall paint color using color tiles at the hardware store. It is my understanding that salmon farming is not good for the environment and in general is not nearly as healthy to eat as wild salmon. The salmon farms are in the ocean off the coast of Chile and in some of the rivers in Canada. They are contained to the point where in general they live in their own excretions, does not sound healthy to me. One of the Salmons primary foes if you would are the sea lice. When the wild salmon come up the river some are affected by the sea lice but in time the river naturally filters this out. In some of the farms the sea lice are rampant due to the fact that filtering is not as effective other than in self-contained farms with the latest equipment. The problem with the sea lice on the rivers has actually affected the wild salmon. It is my understanding that on the farms chemicals are used to rid the water of the sea lice, the chemicals can’t be good for the fish. Maybe not in all cases but it is my understanding that dye is used for the farm raised salmon to give them their color. The standards for Farm raised salmon are also not as strict as the wild salmon. This information is from different articles that I read and because of this I choose to eat the wild salmon. Also depends on which type of salmon. Sokeye are really bright but Pink salmon are, well, pink. I understand the need for farmed salmon. Um, there is no such thing as wild-caught Atlantic salmon. All wild-caught is Pacific only. Atlantic salmon is farm-raised only. They genetically modify the fish to grow year round vs seasonally. Children have growth spurts. There could be serious developmental issues if they were forced to grow all of the time. Where did you get the idea there is no such thing as Wild Atlantic Salmon? I have caught many wild Atlantic Salmon. They swim up our rivers in the UK every year! Here in Australia,we have many salmon farms down in Tasmania,which is the most southern state and therefore,the water is colder.The farms stock the Atlantic salmon variety and they [the farmers] admit to feeding colouring agents to their fish in the feed diets to obtain a pink/red hue.As for the feed menu,it is basically dog pellets and the “poultry products” are ground up beaks,feet and legs so nothing goes to waste.The big problem here in Oz is that the retailers try and sell the farmed “pink/red” salmon at the same price as the properly wild caught sockeye..and there is a definite difference. So where do we buy wild caught White King Salmon, and how high is the mercury level in it! I’ve stopped eating albacore tuna and salmon due to mercury levels (never eat farm raised fish I strongly agree, same with farm-raised shrimp) Now I’m concerned about the Krill oil I’m taking, I read about krill and possible levels of mercury being on the lower side also have been researching krill oil company processing, it sure doesn’t’ sound too promising, any feedback?